Job cuts at work are imminent. My employees have to write a report which in affect will determine if they keep their jobs. It’s a terrible, terrible time. And to top it all off, I’m not allowed to help them write said report. I decided to assist them in another way. I made lunch for them the entire week. First up for day 1: Fried chicken and coleslaw. I’m a southern boy at heart and I’ve tried dozens of fried chicken recipes over the years. Leah Chase is the gold standard. But this Bon Appétit recipe that I used to feed my employees is smack yo momma good. It’s pretty simple. Cut up a whole chicken, cover the pieces with a dry rub of spices, leave it in the fridge overnight. 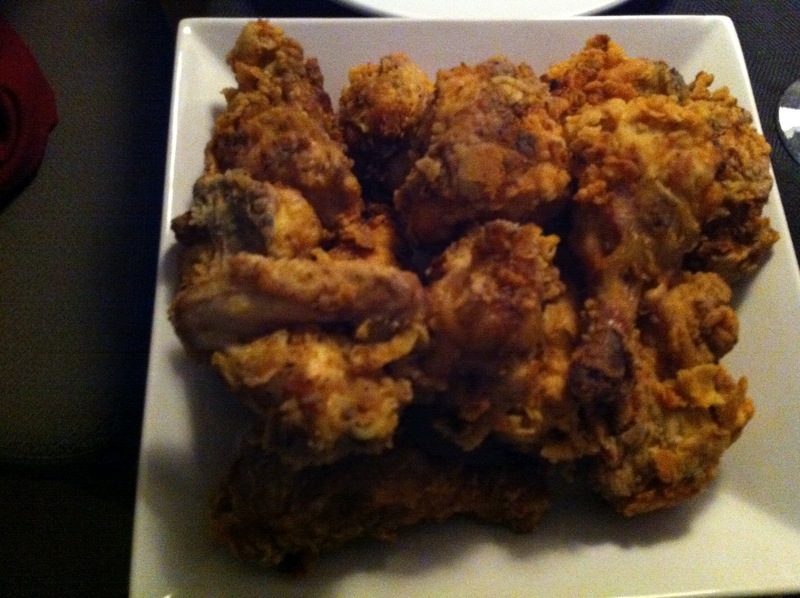 Dip the chicken pieces in buttermilk, then in flour, then fry it all up in peanut oil for ten minutes. Perfect fried chicken guaranteed. The coleslaw was pretty interesting. I spotted this recipe while watching an episode of Bobby Flay’s BBQ Addiction. I got a puzzled look from the Loblaws produce guy when I inquired about the location of the jicima. Luckily a cool dude at my neighbourhood Farm Boy knew exactly what I was talking about and led me to the stack of jicimas near the potatoes pile. Appropriate, since jicima tastes like a cross between a potato and an apple. Regardless, it was the key ingredient to this impressive coleslaw. Thanks Farm Boy Montreal Road! ← They beep when they back up! Great blog you have here.. It’s difficult to fjnd quality writing like yours nowadays. Thank you. That’s very nice of you to say.